We've previously written about our frustration at the lack of LEGO Technic sets that are not vehicles. My kids just aren't interested in vehicles but they love building LEGO machines that actually do something. They want to build amazing machines that do interesting stuff. Ultimately they'd like to come up with their own designs but it's really useful to follow models built by others initially to develop the skills. My 9 year old has recently got really interested in building LEGO Kinetic Sculptures and models so we've been looking again to see what's available. I've taken a look at the LEGO Technic range for 2016, and it's more vehicles. We've had a lot of success with the fabulous Klutz LEGO Crazy Contraptions book which uses technic parts to create fun mechanisms. This is a really good option for getting started. The book comes with the LEGO Technic pieces that you need to build the models and is great value. It's very convenient to know that you've got all the Technic pieces you need to make the models. There's also a follow-on Klutz LEGO Chain Reactions set which builds a set of models that can be chained together. The end result triggers a tennis ball being dropped for a dog to catch, Ruby approved. There's also the LEGO Power Functions Idea Book which has some great mechanisms that can be automated using a LEGO Power Functions motor. This very visual book introduces lots of useful building techniques. You'll need a good range of Technic LEGO to be able to build all the models in the book. We bought a big collection of LEGO Technic parts on eBay to go with our Power Functions set. My 9 year old son has recently been inspired by the fantastic models over at JK Brickworks. We've written a post about his experience building the amazing Sisyphus LEGO kinetic sculpture. It was hard work finding all the pieces but the model was made from common parts so we were quite successful except for a few placces where we had to compromise. It was definitely worth the effort! This model was also designed to work with a LEGO power functions motor. One of the models from JKBrickworks has even been made into a product via LEGO Ideas. Yay, a Technic-centric LEGO set that isn't a vehicle and does something cool. This is a great example of what can be done with a technical build and there are lots more at the JKBrickworks site. 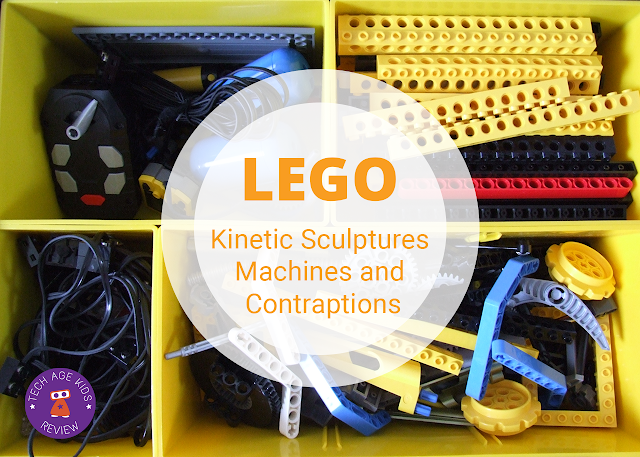 The LEGO 9689 Simple Machines Set is a great set for exploring the principles of machines. It has instructions for lots of technical models to build. The LEGO Education Simple And Motorized Mechanisms uses LEGO Power Functions components to automate models. There are also add-on Pneumatics and Renewable energy sets that extend this base set. The education sets are obviously designed for use in an education setting, but if you have an interested child then they're good for home use too. LEGO WeDo is another range designed for educational use. It combines LEGO Technic parts with programmable electronic components to allow kids to create cool models. It's fantastic. It is expensive for home use but will make sense for some families. The instructions for the models is provided in software which is an additional cost, but a necessary one to make the most of the set. The older LEGO WeDo range is still available and the new bluetooth LEGO WeDo 2.0 version came out this year. Check out our LEGO WeDo 1.0 vs 2.0 comparison or look for LEGO WeDo on eBay. Other LEGO ranges often feature some Technic pieces and Technic-style constructions. These aren't usually the main feature of the set and don't offer a big technical build, but they do offer more choice. My kids have collected quite a few Technic pieces from the Ninjago range, usually still from vehicles, but at least they are fantasy vehicles which my kids much prefer. The LEGO Angry Birds range has some cool contraptions which are worth checking out, LEGO Friends has an upcoming amusement park range which includes a large roller coaster, and LEGO NEXO Knights also have some sets with moving parts. You'll find Technic parts in the Star Wars theme and elsewhere too. For older builders there are the LEGO Creator Fairground sets. These are amazing, but they're big and expensive. LEGO have brought out various Ferris wheel sets over the years. Ferris wheels are cool, but by their nature the build is quite repetitive! They take up a lot of space too. It would be nice to see some other big models that have kinectic features. There are some non-vehicle Technic options for getting started and in the LEGO education range but we'd like to see more fun models designed for home use that help develop kids engineering skills.